22nd Century Releases second studio CD "Where's Howie?!! Yesterday was an incredible day for 22nd Century. Our second studio CD was released and picked up by the mainstream press. On top of this, we also launched the video for the single "Teenage Underwear Model". The press release is below the video. On a personal note, I am so proud to be part of this CD. This is the best music I've ever been a part of. Thank you to all those who supported us over the years. Thank you Adobe for allowing me to pursue this hobby while representing the company! This is for all of you, to make you laugh and rock out. Relax, lean back and just enjoy the melodies! 22nd Century releases 2nd CD, covering Martha & the Muffin's "Echo Beach"! VANCOUVER, Jan. 6 /CNW/ - Following up on 2009's successful debut CD "The Twenty Second Century, Canada's 22nd Century released "Where's Howie?!!". Produced by legendary rock producer John Webster (credits: Aerosmith, Alice Cooper, Scorpians, Motley Crue) and mastered by Todd Simko (Pure), Where's Howie was recorded in Vancouver's Mushroom studios and released Jan 6, 2011 on Bugnut Records. The 10 song CD includes covers of Martha and the Muffins "Echo Beach" and The Angel's (aka "Angel City") No Secrets which charted in Australia as high as #8 in 1980. 22nd Century recorded the new CD with punk rock superstar Zippy Pinhead (The Mutants, The Dils, D.O.A.) on drums to fill the void of Glenn Golflom who left the band in 2009 to pursue excellence in business. The trio have briefly toured, playing to audiences in North America while enjoying success from the first CD including winning the popular vote in a National battle of the bands contest, being nominated by the Somojo UK as a finalist for "Rock Artist of the Year" and having radio airplay in dozens of countries worldwide. "The band's three members, Duane Chaos, Tim Plommer and Zippy Pinhead, have really merged their musical direction" stated Eddy Bugnut of the band's label. "The songwriting is really strong in the singles Teenage Underwear Model and U Generation as well as the title track, Howie the Skid. When I first heard U Generation it reminded me of The Who's earlier live performances. It is a song that basically kicks you in the face from start to finish". The CD's will are available via most popular digital distribution sites such as iTunes, Rhapsody and Napster while the band's label uses many Web 2.0 social media patterns to market the music via their own network. Media outlets wishing to receive a copy of the new CD for their review department may use the contact information below. This is far too ironic to keep to myself. 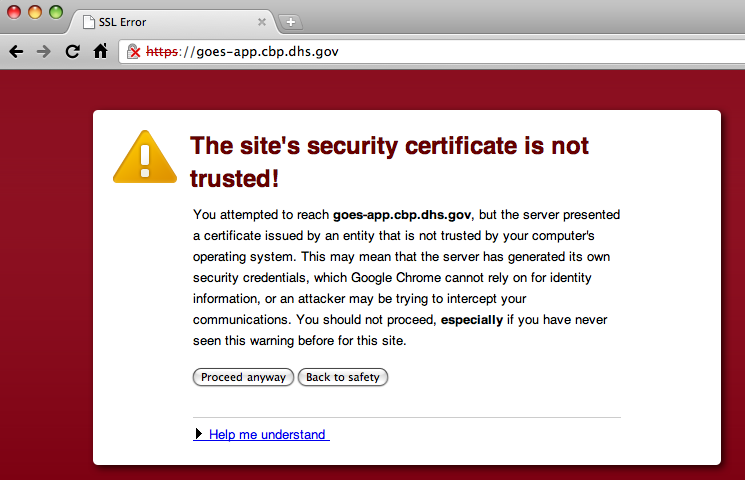 I went to log onto the goes account at dhs.gov and got the following error in Chrome. ROTFL!!! 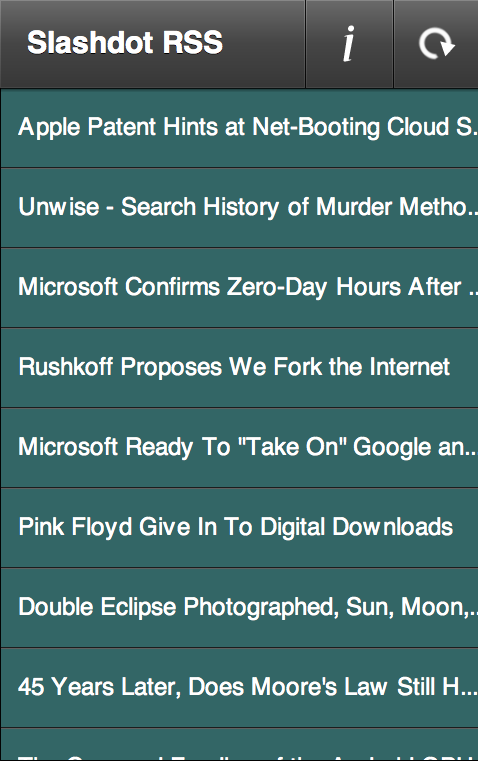 This is part 2 of the tutorial to build a Slashdot RSS Android Application. The entire source code is available as well as the application. In part two you will learn the architectural perils of mobile development plus how to mitigate them to save CPU and bandwidth as well as some best practices to satisfy your end users. The topic chosen was how to read an RSS feed from Slashdot.org and display the list on a mobile device, then retrieve specific RSS items when the user makes a selection. Building an Android Mobile RSS Reader in 30 Minutes - Part 2 from Technoracle on Vimeo. 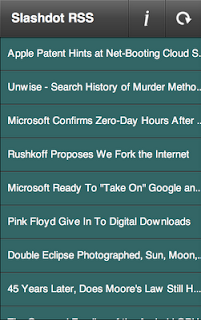 Over the break I got to devote some time to coding and finished the Slashdot RSS application. The application is now on the Android market and a full description can be found here (or just download and install it to your device). A complete video tutorial and written course will be published shortly.